Rocket into battle against the Rebels with this TIE Striker that is a streamlined variant of the classic TIE Fighter! Designed for atmospheric patrols over important ground-based installations, they are piloted by the Empire’s very best TIE Striker Pilots, who rely on their lightning-quick reflexes and fearlessness to survive tours of duty against enemies of the Empire. 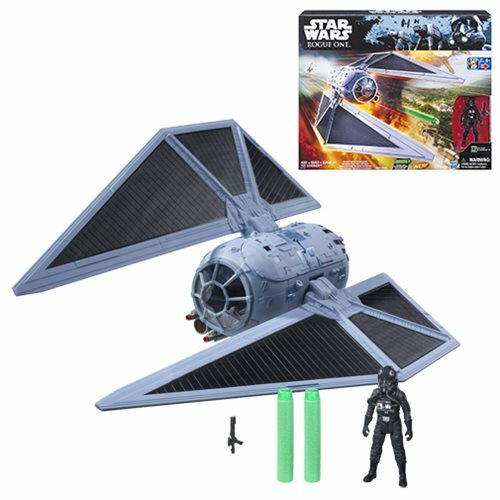 Chase down enemy starships with NERF firing cannons that shoot 2 included NERF projectiles as you re-create the most embattled, most intense moments of adventure from Star Wars: Rogue One with this movie-accurate reproduction of an Imperial TIE Striker and Imperial TIE Striker Pilot!